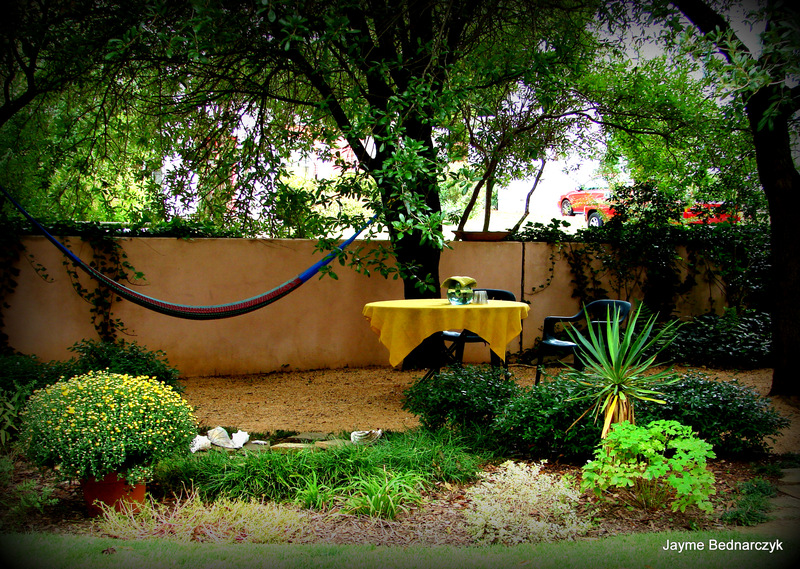 One of them was a charming gem of a garden… located in an urban neighborhood, cleverly designed as a private escape with a stucco wall, softened by vines, providing a warm hug of privacy.. Gentle breezes, blowing table cloths – transporting me to a country hideaway. 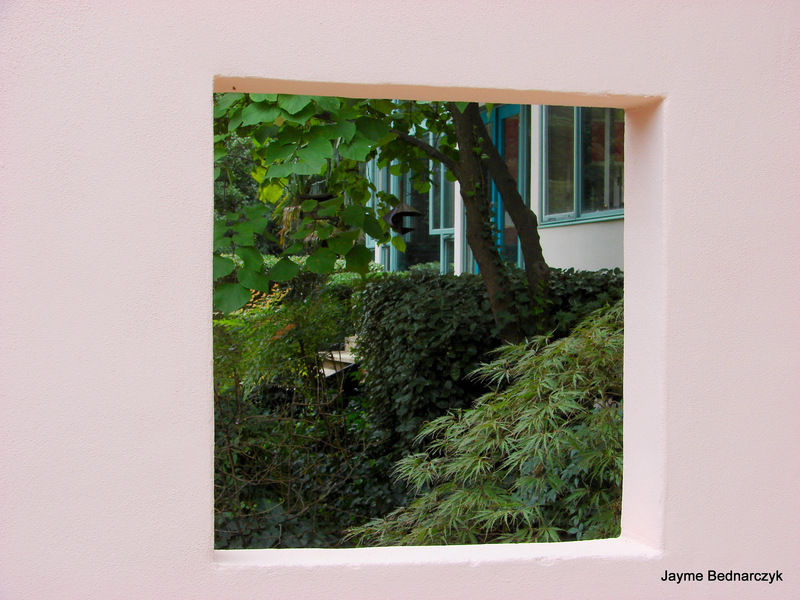 Bevelled opening in wall to frame the view. The memory is so visceral. Fall 2008 – My friend Beth and I sat in the Harmon driveway, greeting guests for the Garden Conservancy Open Days Tour – taking tickets, answering questions and simply enjoying the discoveries in this magical setting. By the day’s end, I sat in every place provided for lingering – to capture a better understanding of the effortless design, to breathe it all in – beauty and peace – to capture a memory. 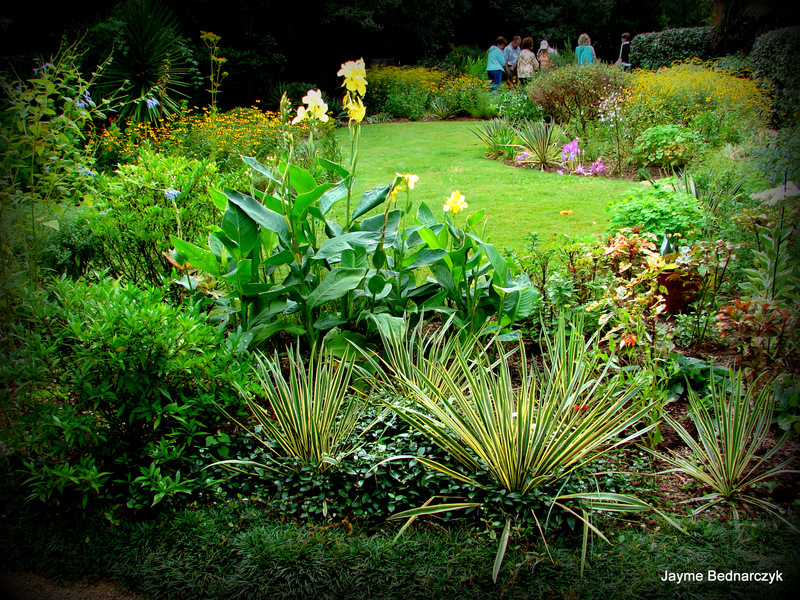 Judy Harmon, ASLA (RIP) – a landscape architect, had lovingly designed and planted this garden. For Judy, it was her and husband Frank’s private space – integrating interiors with exterior living. 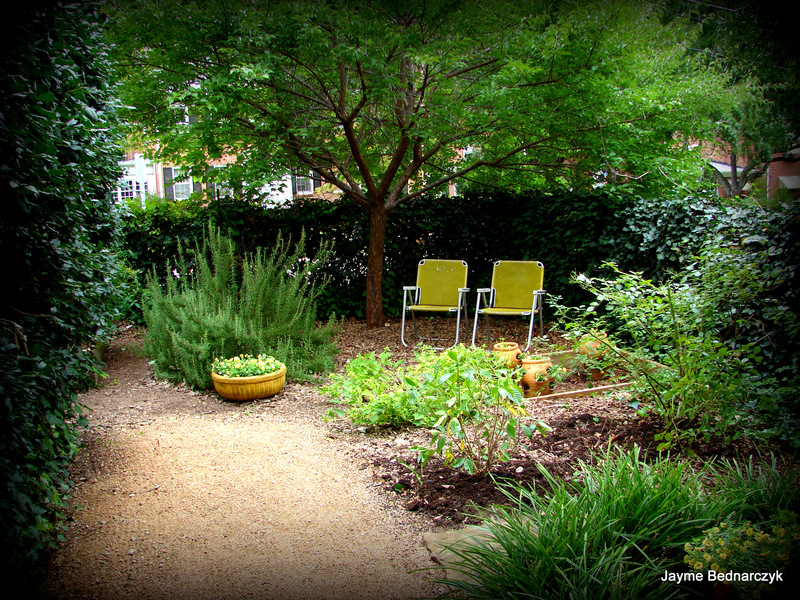 The swaths of plants on a tiny lot – sensitively complementing and enhancing the lines of husband Frank Harmon’s (an amazing architect, teacher and green advocate) contemporary design for their modern home. The Modern dwelling, provided an integrated backdrop – contemporary softened by visual living movement – of light and color and water. Punctuated along paths by simple visual shapes for contemplation. Frank Lloyd Wright’s designs were shocking at one time, yet with time, revered for his ideas, scale and functionality. Over time, his designs are now historic pillars of architecture. New subdivisions of faux period bungalows today flourish and beckon to a safer time – before cul-de-sac s, and soccer moms, when kids walked to school and played in the streets… times when Moms’ spent more time in their homes that in their SUV’s waiting in lines for school or Chick fil-A orders! I love contemporary design as well historic design. There is is place in time for each. With open minds, a respect for the new and the old to live together – to balance each other. 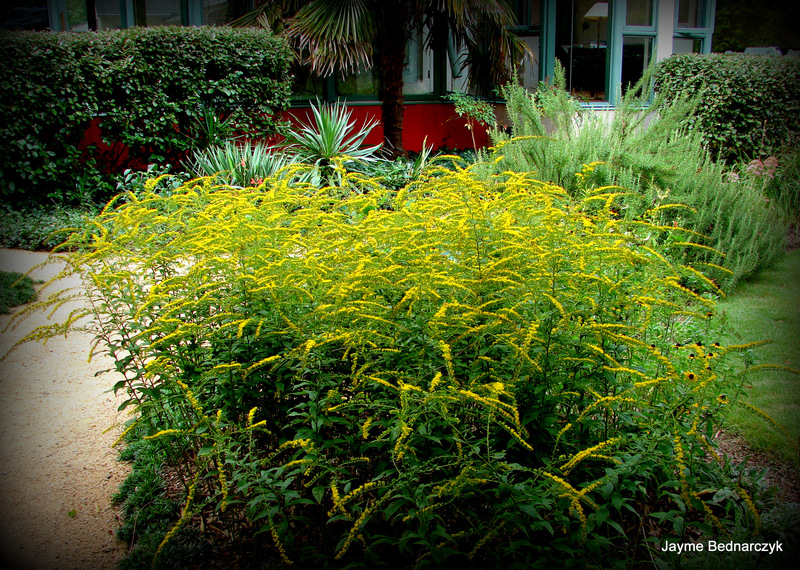 Every fall as Solidago rugosa ‘Fireworks‘ – golden rod – bloom, catching and swaying in the breeze… I think of that glorious day in Judy’s Garden. Old fashion golden rod bred for a shorter explosive stature, cleverly punctuated – with the yellow of other flowers and furniture and repetition of Yucca filamentosa ‘Bright Edge’ – grouped in clusters of fives giving structure and a modern edge. Greens contrasting the strong Red of the contemporary dwelling… with exciting complementary scheme and the yellow marrying it all together in soft drifts of movement and color. It is brilliant, old and new, yet fresh and fluid as the pressed linens in the breeze. While asking Frank if it was OK to feature his charming watercolor painting of Elizabeth Lawrence border, (stop back tomorrow), I spoke of my sweet friend Judy, his wife and partner and her garden. He was touched and knew Judy would be smiling her sweet impish smile of approval… to be remembered and to once again be sharing her garden.